I am Dutch and being Dutch I have been given Dutch names. A first name, a middle name and a last name, to be more precise. Now the last time I went to the USA, I frequented Starbucks establishments—a well known ‘java’ dispensing chain of cafes that appears to be ubiquitous, or at least so it seemed in the state of California. Now the funny thing is that with every order they ask for your name and then write that on the cup that will get filled with your coffee. So when your order comes up, they’ll be able to call out your name so you know your coffee is ready. Very convenient… in theory. But my names being Dutch, they kept misspelling it and mispronouncing it. Annoying, but what to do? Initially I just made up names. It’s not like they’re going to ask for an identification card, right? I think at one point I may have called myself ‘Bob’ or ‘Jack’ because I reasoned those would likely be rather popular names and therefore less likely to invite spelling errors. On the other hand, very common names increase the risk of confusion: there might be another ‘Bob’ or ‘Jack’ waiting for his order. Now I could use more obscure names, like ‘Ferdinand Ignatius the 3rd Count Von Schtockhausen zu Lieberwurst’, but that might blow my cover as it sort-of sounds like I made that up (which would not be an unfair assessment). Also I fear it would be a bit of challenge to fit all that on a coffee cup, even the humongous specimens found in the US. So I recently decided to search the internet for a source of information that might tell me the etymology of my Dutch surnames, and whether I might be able to find a decent English version for either of them. That would be the best solution, I think. After a bit of searching I came across the site “Behind the Name” where I was able to look up my first name. Apparently, the English equivalent would be ‘Maynard’. Cool. So then I continued with my second name. That was a bit trickier. As it turns out it’s Laurence, but in the US the more common spelling is ‘Lawrence’. Hence my comment on it being trickier. However, as both versions sound the same when called out it won’t make any difference which one I use. As a matter of fact, I’ve used ‘Lawrence’ in a Starbucks on Melrose Ave in Los Angeles at one time. Although they misspelled the name, I still got my coffee just fine as you can see in the picture. So I’ll go with Laurence here. 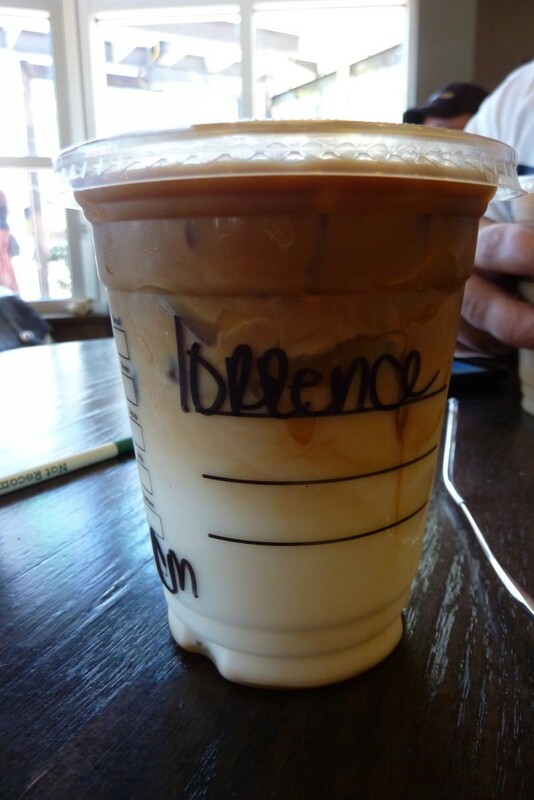 The way ‘Lawrence’ is spelled at Starbucks. As for my last name (‘Voogt’), well that really is a bit trickier as there is no English version for that one. There is however an English way of pronouncing ‘Vogt’, a name related to mine. Thus I imagine the correct way to say my name would be to pronounce it just as ‘Vogt’ but instead with the ‘oo’ sound as in ‘root’. With a silent ‘g’ it would therefore sound something like ‘voote’ instead of ‘vote’. One snag though: that would make my name sound like ‘voet’ which is Dutch for ‘foot’. And I can’t accept that because I support the metric system, so I guess I’ll just have to go with ‘Vogt’. The extra ‘o’ in ‘Voogt’ is probably a typo anyway. Ok, nearly there, but ‘Maynard Laurence’ doesn’t sound quite right. To my ear ‘Laurence Maynard’ sounds better and that’s what I’ll use. So here is my full name in English: Laurence Maynard Vogt. Starbucks, here I come! I think ‘Maynard’ really works as a second name, reminiscent of John Maynard Smith. Sounds like a Bond villain. Excellent! I was always a bigger fan of the villains anyway, with their multistory sub-terranian rocket-launching-volcano lairs with shark infested swimming pools. Bond on the other hand just stays at hotels and casinos. So boring.